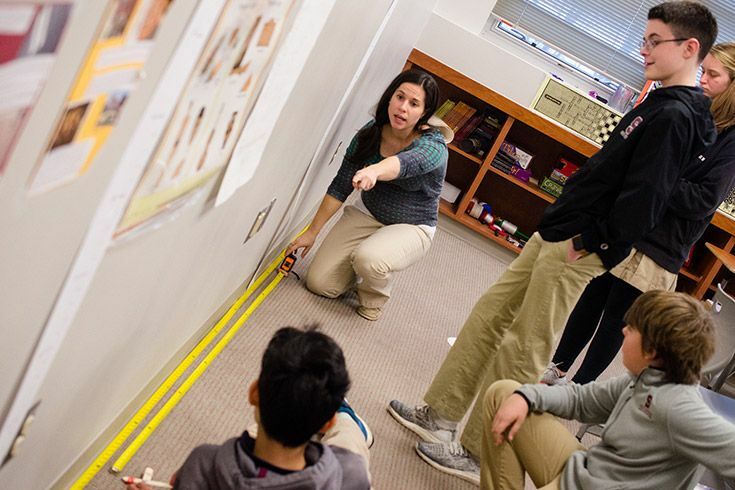 Middle School math teacher Ms. Rachel McMahon is helping her students see the practical application of complex mathematical concepts, bringing math from the realm of the abstract into the relatable real world. When students ask “How am I ever going to use this in real life?” Ms. McMahon answers with hands-on activities that not only serve a meaningful purpose, but are also fun and engaging for her students. From simple addition to complex equations, mathematics is a way of describing the world around us. We use it to approximate natural processes so we can predict, replicate, and test — modeling everything from the fluctuation of the stock market to the trajectory of missiles used by the military. Even so, these models can be so complex that students have difficulty connecting the model to what it represents in the real world. Ms. McMahon is helping her students build those connections with two hands-on projects, Quadratics in Motion and Design My Backyard. Ms. McMahon’s students start learning about quadratic functions by studying parabolas — graphs of those functions that create “u” or “n” shapes — and learning the associated terminology. They learn how to manipulate these graphs before modeling the concept with a hands-on catapult activity. Ms. McMahon explains that catapults use projectile motion to launch objects across distances. The class discusses the variety of factors that can affect the distance an object can be launched, such as the weight of the object, how far the catapult is pulled back, and the catapult’s strength. Her students then investigate the parabolic motion created from catapults and how those different factors affect a projectile’s flight. To do this, her students build simple catapults with popsicle sticks and marshmallows. They launch the marshmallows, record the flight path with their iPads, and review the footage to find the starting point, ending point, and vertex. Using those three points, they create an equation that models the flight. It’s a very challenging task, but possible — that’s what makes it fun for the class. Ms. McMahon helps the groups set up tape measures to collect the catapult flight data. 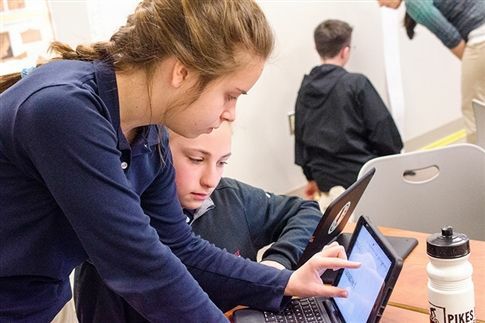 Ms. McMahon’s 8th-grade geometry classes spend two units studying the areas and lengths of two-dimensional figures and the surface area and volume of three-dimensional figures. These concepts are easier for students to grasp because they observe 3D and 2D objects every day. But to ensure that her students truly synthesize their knowledge, she created a hands-on activity that requires her students to use both of these sets of skills at the same time and to do so within a framework that feels real to them — by designing and creating a model for her dream backyard. Ms. McMahon introduces the project by asking her students to take on the role of a landscape architect. She “hires” them to design her dream backyard and provides constraints and specifications, just as a client would in the real world. She requires some features, asks for a minimum of four extras, and indicates that at least 20% of the yard be free space to avoid clutter. Daniel Berlin ‘22 marking the features on his blueprint design. Just as a real landscape architect would, Ms. McMahon’s students complete this project in stages. They start by creating a bird's eye blueprint for their design on graph paper, using color to indicate features and marking the exact measurements. They then create a detailed rendering of the pool that represents the 3D object accurately in a 2D space. They have to account for the depth of the pool including a shallow and deep end along with their calculations for surface area and volume. 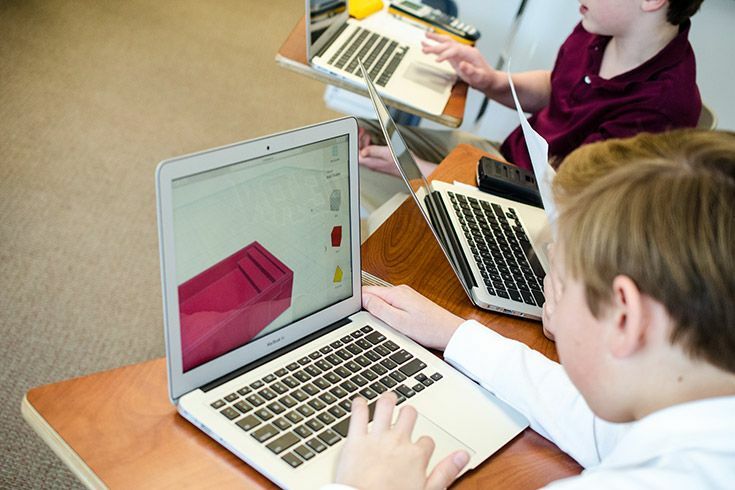 Finally they head to the Graw Innovation Center to create a laser cut model of their designs using Adobe Illustrator and a 3D model of the pool with Tinkercad. They move from simple proportional reasoning to more complex throughout each step of this process. To complete the assignment, their 3D printed pools nest in the laser cut design to mimic a model that an architect might create to show a client before starting a project. Authentic learning is woven into the fabric of how we teach in our Middle School. 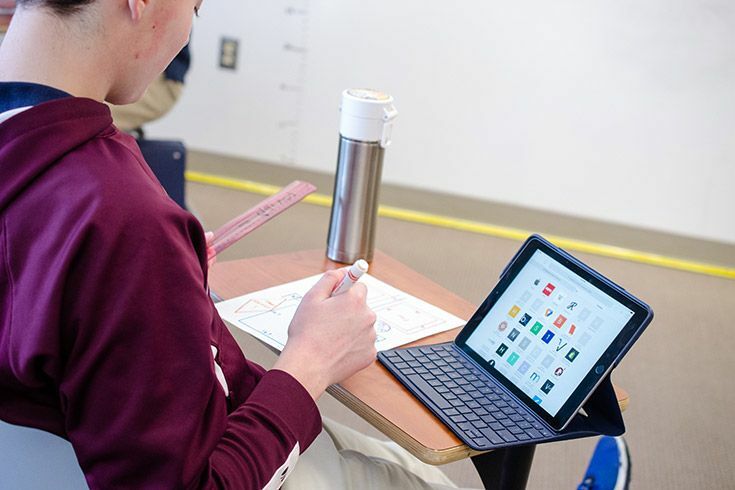 Our teachers strive to create experiences in the classroom that demonstrate the real-world value of the subject matter and inspire our students to solve problems creatively and independently. Fiona Griesser '22 and Reese Jackson '22 recording their catapult data.